SPW045888 SCOTLAND (1934). 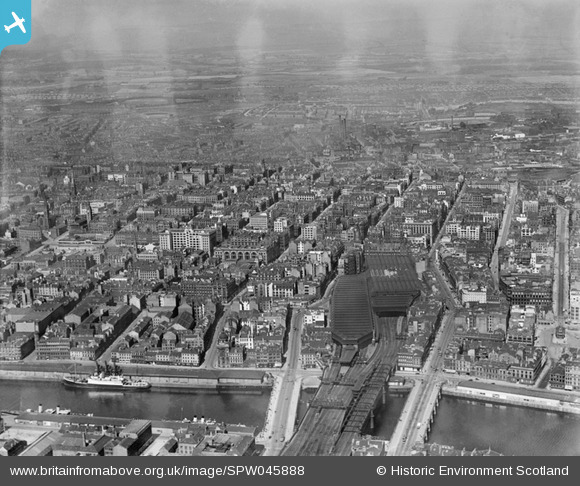 Glasgow, general view, showing Central Station and Wellington Street. An oblique aerial photograph taken facing north. Title [SPW045888] Glasgow, general view, showing Central Station and Wellington Street. An oblique aerial photograph taken facing north. St Vincent Street Free Church. St Vincent St (84-94) Northern Assurance Company Building. Union Street at Gordon Street. Argyle Arcade at Buchanan Streets Reid Mansion. Central Station (Heilanmans Umbrella) at Hope St. Corner of Clyde St. and Jamaica St.
Union Street at Gordon Street, Ca' D'Oro Building. Custom House in Clyde Street, c 1895. It was designed by customs officer John Taylor and opened in 1840.